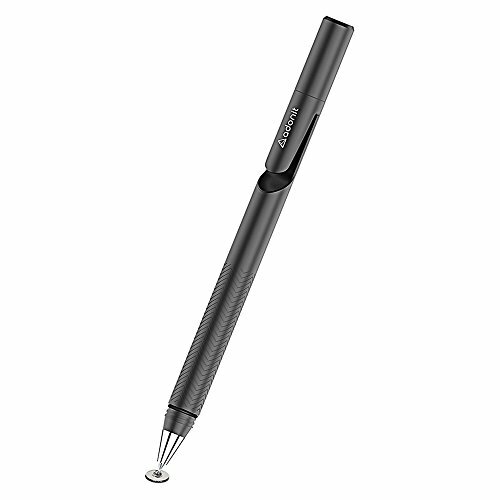 Jot Pro is the most precise basic stylus around for writing and drawing on touchscreens. The Precision Disc writes exactly where you place it with ballpoint accuracy - and a smooth feel, thanks to a cushion tip. The solid, aluminum and steel stylus is built for sleek simplicity, including a carrying clip. Whether you're working with an iPad, iPhone, Android, or Windows device, Jot Pro is always ready to go. No connection or batteries needed, just touch stylus to screen. Works smoothly: Dampening tip cushions screen contact for fluid, quiet writing.